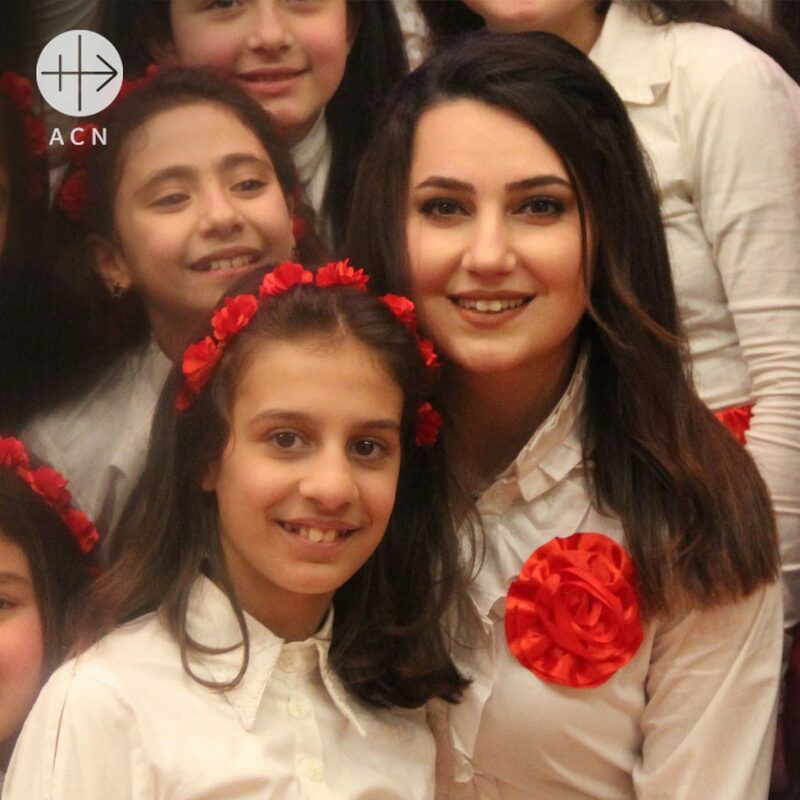 Montreal, Monday April 8, 2019 – In Aleppo the number of Christians declined fivefold during the war. Now the economic crisis and the lack of professional employment opportunities are a source of anguish, especially for the young who are facing a 78% unemployment rate! Pierre Macqueron from ACN France met with Miriam, a transformative voice. The performers are a choir of 60 or so children and young people, supported by five musicians. It is Saturday March 17, in the late afternoon. The Orthodox Youth Movement is celebrating the 60th anniversary of its creation. In the packed hall, the audience applauds appreciatively. A simple concept, but something that has become rare in recent years in this city of Aleppo, which was once the economic capital of the country, before the war. Among the young singers is Miriam Toubal, aged 23, a student in biotechnology, conducts the children’s choir. Over the last year, for one hour a week, she has rehearsed with them in singing these songs. The rehearsals are at least less stressful than during the war, though even that didn’t prevent the choristers from attempting to gather and sing. It’s not long before Miriam confides in us her anxiety as to her future. Finding a good job so as to be able to continue living decently is a major challenge in a city devastated by six years of war, and since then by the economic sanctions. In Syria the level of youth unemployment is an estimated 78%. And so many of these young people are deeply concerned for their own future and that of those they love. Since the end of the fighting, the situation has not got better in this once prosperous city. Quite the contrary, in fact. So many of the citizens of this town will tell you about the difficulties of daily life. The economic recovery, so long-awaited, is still not happening, and the average job does not pay well enough to provide the basic daily needs, so rapidly have prices risen. The souk, whose 13 km of stores and boutiques were once the pride of the city and were classed as a world Heritage site by UNESCO, still lies in ruins and has not yet been restored. In front of what was once his own stall, Elias Farah, on returning there for the first time, cannot hide his emotions, noting anxiously that the whole place seems to be in imminent danger of collapse. The former economic capital of the country is suffering terribly from the economic embargo. 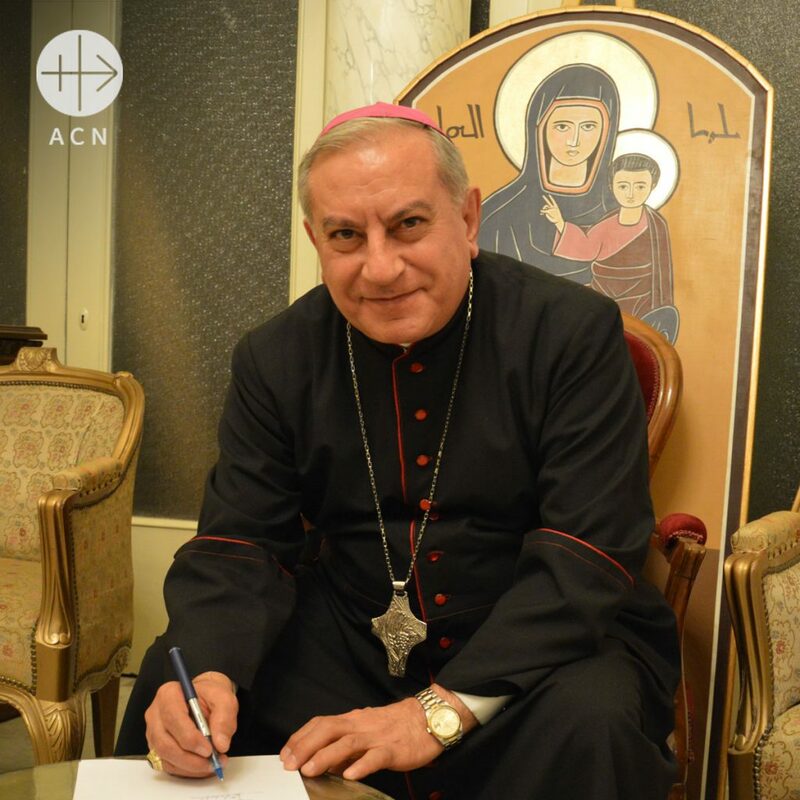 “It’s the poor and the ordinary people who are suffering above all from the situation,” says Syrian Catholic Archbishop Antoine Chahda of Aleppo. The war is continuing and the lack of future prospects is only adding to the unhappiness of the families and the despair of so many Christians. In the suburbs of Aleppo, the industrial zone is a desolate sight: the bombed out factories have been looted, and there is no sign of any activity whatsoever. In order to meet their daily needs, whether in Aleppo or in Homs, the Christian communities have organized themselves and are counting on the generosity of the universal Church. Once prosperous, they have become beggars, says Greek Orthodox Bishop George Abu Zakham of Homs, noting at the same time that the foreign aid is decreasing. The support supplied by ACN, in the form of medical and food aid, help with rent and education, remains indispensable for many families. Lay committees have been set up, in order to be able to share out this aid fairly among the various different Christian communities. Their task is to identify the most urgent needs and closely monitor the use of the aid supplied. It is an effective system and one that enables the different Christian Churches to work together. It is a vital form of aid, and one that is rekindling a new spark of life in the stale air and smoldering ashes of a city in ruins. For a brief moment, Miriam was the voice of that city. From March 2011 up to the end of 2018, ACN provided 44.2 million in aid for Syria, through the support of 738 different projects – 80% of these projects were in the form of emergency aid.